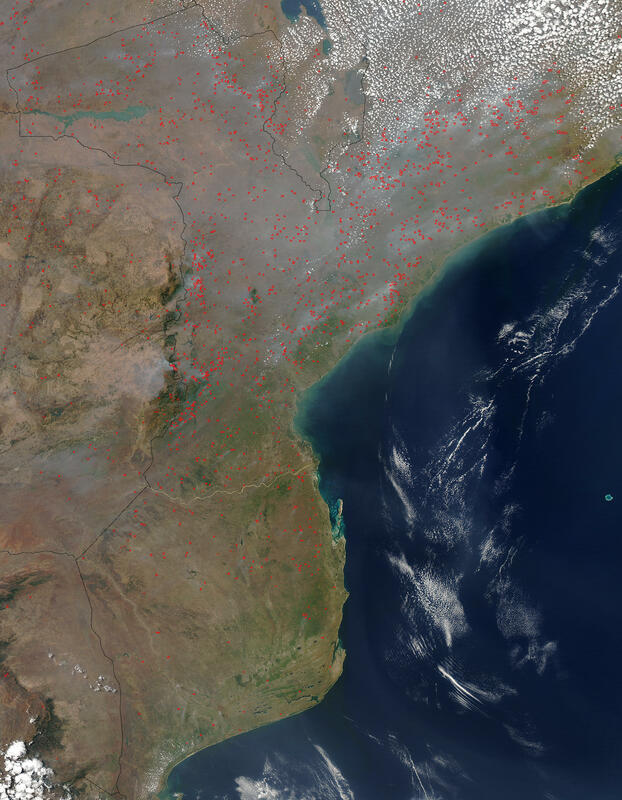 Smoke from hundreds of fires (marked with red dots) hangs over Malawi (top center), Mozambique (center), and Zimbabwe (left) in southern Africa. The inset (outlined area in center shown in higher detail at lower right) reveals how dramatically humans have altered the landscape through agricultural practices that involve recurring use of fire. The isolated patch of deep green at upper right of the inset is Mozambique’s Gorongosa National Park. Along Mozambique’s border with Zimbabwe, other patches of green dominate the mountains in the region. The other image in this series shows similar alterations in Madagascar. Fire—both naturally occurring and human-made—has been part of the landscape in southern Africa for hundreds, if not thousands of years. Despite its necessity and usefulness as an agricultural tool, there is some concern among scientists that as human populations continue to expand and the need for agricultural land grows, too much fire may begin to damage the land, increase greenhouse gases, and harm human health. The flip side of that story is that there are also places where fire suppression is altering the natural vegetation of the savanna landscape, which is home to grasses and shrubs that have evolved with fire over hundreds of thousands of years. This image was captured by the Moderate Resolution Imaging Spectroradiometer (MODIS) on the Aqua satellite on October 3, 2003. The high-resolution image provided above is 500 meters per pixel. The MODIS Rapid Response System provides this image at MODIS’ maximum spatial resolution of 250 meters. 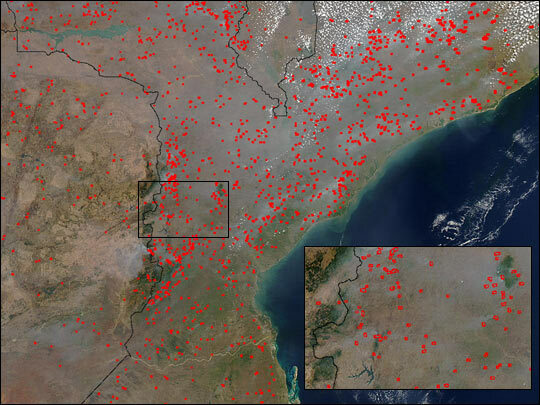 In southeast Africa smoke from hundreds of fires hangs over Mozambique and Zimbabwe on October 3, 2003.